I'm trying to make a dungeon crawler type game and I thought a nice way to do the game screen would be raycasting. Unfortunately, the raycaster I have built only works at an FOV of 60 degrees of less, while most dungeon crawlers show more than that. After some experimentation, I found that an FOV of 120 degrees includes everything I want on the screen. There's just one thing. Even with fish eye correction, the screen begins warping at anything higher than 60 degrees. curPointHoriz.x <= 0 or curPointHoriz.x >= #self.map*100 then -- It's outta da map! else -- Increment them, we didn't hit nothin'! 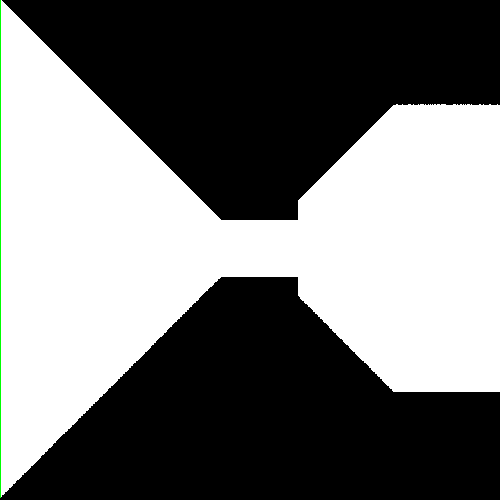 curPointVert.x <= 0 or curPointVert.x >= #self.map*100 then -- It's outta da map! else -- Increment them, we didn't hit nothin' (again)! 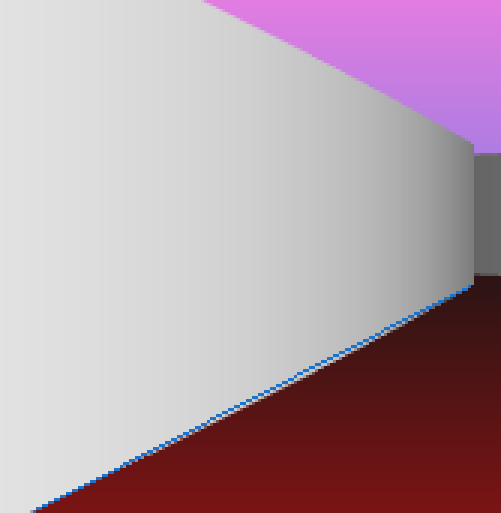 If I had to guess, I would say the code causing the malfunction is here, as that's where I start doing calculations to actually draw the walls. Thank you for any help! A readme is included that lists the controls. Hi Aidymouse, welcome to the forums. Edited to remove my previous text because I misunderstood. I thought you were worried about the natural distortion in rectilinear projection, and you were trying to compensate for it. Now I think you want rectilinear but you're trying to compensate for the "natural" barrel distortion that happens in raycast and that's what doesn't work so well. I think the problem is before that section. 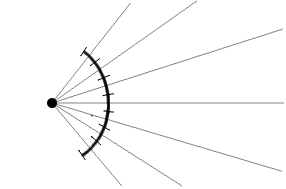 The angle increases by a constant increment of 0.12 degrees for every ray, and that can't be right. It should not be constant. 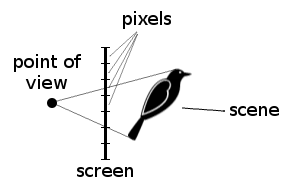 You should calculate the angle corresponding to each horizontal screen pixel. The angles for the pixels near the borders are smaller than near the centre. Last edited by pgimeno on Mon Aug 20, 2018 8:13 pm, edited 5 times in total. If you Ctrl+F "fisheye" it will point you to some code that will act as fisheye-correction. After the DDA is done, we have to calculate the distance of the ray to the wall, so that we can calculate how high the wall has to be drawn after this. 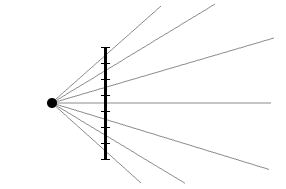 We don't use the Euclidean distance however, but instead only the distance perpendicular to the camera plane (projected on the camera direction), to avoid the fisheye effect. The fisheye effect is an effect you see if you use the real distance, where all the walls become rounded, and can make you sick if you rotate. I'm just a bit confused on what this part means, namely the bit about calculating the angle corresponding to each horizontal pixel. Following from the tutorial, it says to take the FOV and divide it by width of the screen (500 pixels in my case). Using this, we can find the angle between each ray so that each column of pixels on the screen has a ray no matter the FOV + the width of the drawn environment stays constant. You know what, I'll just draw a picture. Excuse the innacuracy of the image. Ah... ms-paint. 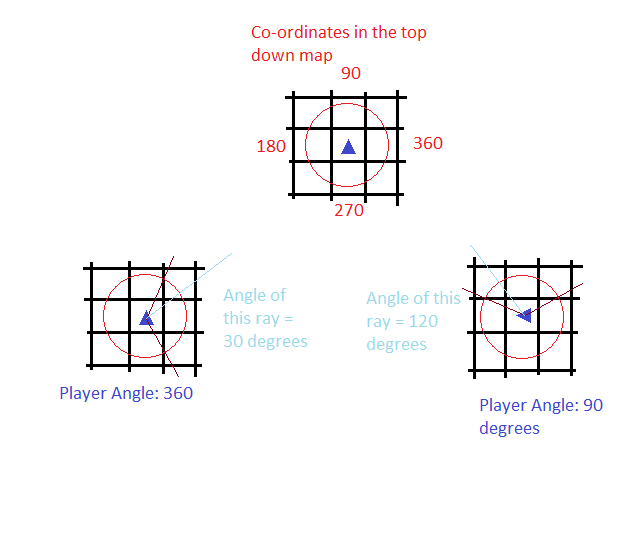 EDIT: The angle of the ray is based off of global angle positioning rather than being relative to the player. This might be a bit confusing but I don't think making the values relative to the player wouldn't fix the issue I'm having. I'm not sure if that illuminates anything. I don't quite understand finding the angle of the ray based on the horizontal screen position. Thanks a lot for your help! I'll keep experimenting and see if I can figure anything else out. The angles for the pixels near the borders are smaller than near the centre. Just a note on this section. Is this what I should be aiming for, or is this what I'm currently doing which is causing problems. Allow me to start from the bottom of your post, to clear up a confusion, as it's very important to the point. I should have said "should be", rather than "are". It's what you should be aiming for. Also, I meant the increments between angles, sorry for not making that clear. I'll try to explain why. Doing that results in projecting the image on a cylinder, not on a plane. The result does not preserve the straightness of lines, that's why you get deformations. You can do it on a plane and still fill every horizontal pixel of the screen. Let me see if I can make you see why. And then straightening the screen (sorry about the hand-made divisions). That's what I meant about projecting the image on a cylinder. 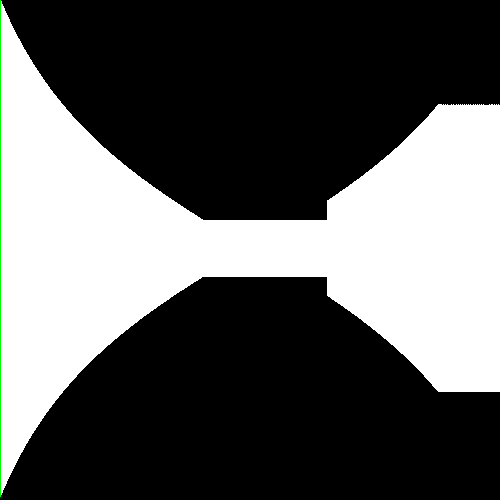 That causes horizontal distortion, even with vertical correction. I don't think you can preserve straight lines that way. With a lower angle of view, the cylinder is closer to a plane, and the distortion is less noticeable, but it's there, even in the demos, as I showed. Now let's go for the math to make it look right. 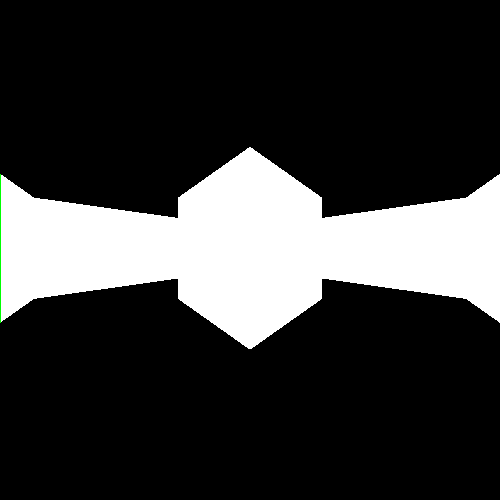 You first need to define the length from the POV to the projection plane. Let's define it as 1 unit of distance. Now, you want to determine how large is the screen, in distance units, with the given angle of view (AOV, which is in my opinion a more proper term for the angle that you call FOV). Since the distance to the screen is 1, that happens to be tan(AOV/2)*2 (we're calculating one half first and then duplicating it). I can make a diagram if you need more explanations. That's the segment that you need to divide by the number of pixels, 500 in your case. Remember to keep half of them above and half below zero. 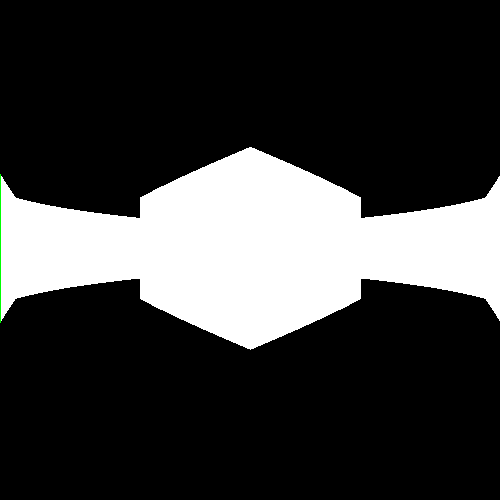 Now, to cast the ray, the angle you need is the angle of the vector that goes from the POV to each pixel, i.e. to each subdivision. To calculate that angle, you can use atan(X coordinate of the subdivision). Again, I can make a diagram if you need to see why. All these calculations can probably be avoided by throwing away angles and using coordinates directly. I haven't looked in detail into the tutorial that Davidobot has linked, but it seems to be much simpler calculation-wise. I have not considered the player orientation. You'll have to add that angle before actually casting the ray. That should be the easy part.